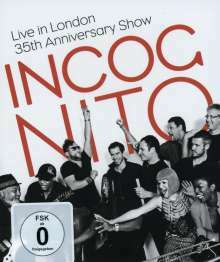 Der Artikel Incognito: Live In London 2014: 35th Anniversary Show wurde in den Warenkorb gelegt. On July 12, 2014, Incognito threw a party that will surely be remembered for years to come. To celebrate the band's 35th anniversary in style, Incognito performed at London's O2 Shepherd's Bush Empire and invited friends, family and fans to join them for a wild night out. »Live In London – 35th Anniversary Show« will be released on 2CD, DVD and Blu-ray. With guest performances by genre and music companion Mario Biondi, American soul diva Carleen Anderson and friends and artists from former and current times like Mo Brandis and Imaani, Incognito plucked out songs from their 17 studio albums for an amazing performance, delivered in style, with passion, with soul and with heart. Formed in 1979 and having been successful for over 35 years now, the global phenomenon behind mastermind Jean-Paul »Bluey« Maunick, presented the band's greatest hits like their #6 UK single charts success »Always There«, their first single ever »Parisienne Girl« as well as recent songs like »Goodbye To Yesterday«, fan favourites and songs dear to the band on this night to remember. The memorable gig brought the essentials of Incognito, the jazz, blues, funk, soul, latin and dance together for a perfect blend. 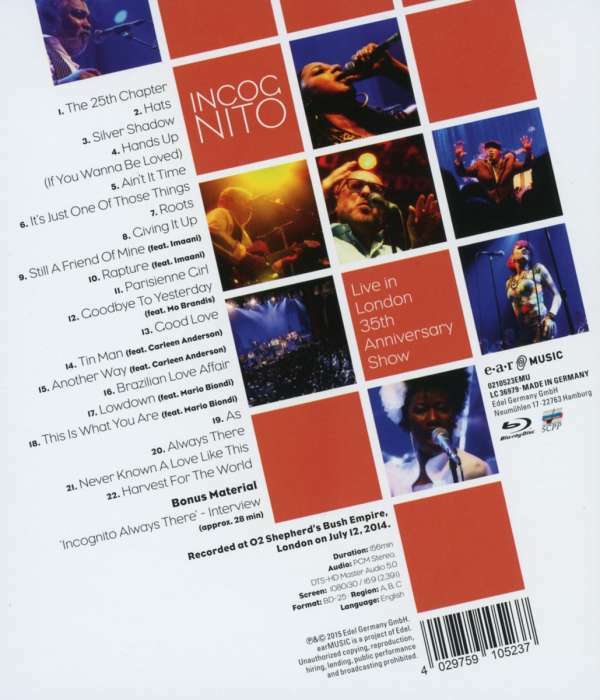 The songs are just as surprising on the HD live video as on CD – a great emotional atmosphere where to feel that Incognito loves and lives the music. Embedded with funky grooves and huge soulful voices this music experience will definitely give you goose bumps in its quieter parts and animate you to lose control in the up tempo ones. So it's time now to turn up the volume and dance!